A farmer waters her plot at the Tjankwa Irrigation Scheme, in Plumtree District, 100km west of Bulawayo, Zimbabwe. Credit: Busani Bafana/IPS. Increased heat spells, coupled with flash flooding and frequent droughts, are making farming impossible and unprofitable as many African smallholder farmers rely on rain-fed agriculture. Irrigation development can increase food security while extending the growing season, securing more income and jobs, said the Malabo Montpellier Panel, a group of international experts guiding policy to boost food and nutrition security in Africa. In a study launched this week, the Malabo Montpellier Panel said Africa has the potential to irrigate 47 million hectares. This can boost agricultural productivity, improve livelihoods and accelerate economic growth. "A number of economies in Africa depend on agriculture," said Ousmane Badiane, Malabo Montpellier Panel co-chair and Africa director for the International Food Policy Research Institute (IFPRI). "That is why water control and irrigation are important to reduce poverty and to eradicate hunger across Africa." About 20 percent of cultivated land worldwide is irrigated and this contributes to about 40 percent of total food output, according to the Food and Agriculture Organization of the United Nations (FAO). Africa is one of the regions in the world with the highest number of people who are hungry. It also has the lowest crop yields in the world as only six percent of cultivated land is irrigated on the continent, compared to 14 percent in Latin America and 37 percent in Asia. "Irrigation must be made a priority in Africa because it works," Badiane told IPS. "Once you commit to irrigation as a high-level priority, you put into place the institution mechanisms to deliver that effectively within government but in partnership with private sector and local communities." In 2014, 54 African governments signed the Malabo Declaration committing to halve the number of people in poverty by 2025. They sought to do this through agriculture growth that creates job opportunities for young people and women. A study, Water-Wise: Smart Irrigation Strategies for Africa found that irrigated crops can double yields compared to rain-fed yields on the continent. Furthermore, the economic benefits of expanding areas under irrigation would be double the costs of rain-fed agriculture under climate change. Greater levels of irrigation have led to better and longer harvests, higher incomes and better prospects for farmers in Ethiopia, Kenya, Mali, Morocco, Niger and South Africa. These six countries are success models for either having the largest irrigated areas or for achieving the fastest growth in expanding irrigation agriculture. For example, Ethiopia increased the area under irrigation by almost 52 percent between 2002 and 2014, achieving the fastest growth in irrigation in Africa. Morocco has nearly 20 percent of its arable land currently equipped for irrigation. In Zimbabwe, FAO has implemented a 6.8 million dollar Smallholder Irrigation Programme (SIP) programme in partnership with the Ministry of Agriculture, Mechanisation and Irrigation Development (MAMID) funded by European Union (EU) to improve income, food and nutrition security of communal farmers involved in small-scale irrigation. The programme has seen the rehabilitation of 40 irrigation schemes has benefitted 2,000 households in Manicaland and Matabeleland South Province. 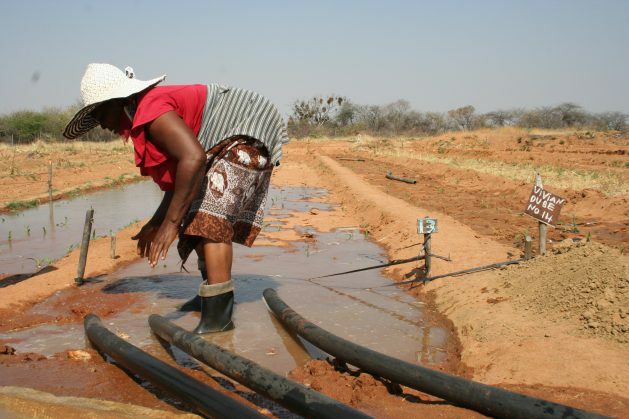 Smallholder farmers in Matabeleland South Province are benefitting from irrigation schemes, which have allowed them to increase productivity even during droughts. Landelani Ndlovu, a member of the 8-hectare Tjankwa Irrigation Scheme, says she earns 400 dollars from growing vegetables under a community irrigation project that started in 2012. "Irrigation has helped us produce more vegetables and crops and to increase our income which we would not do if we relied on the seasonal farming when we have rain," Ndlovu said. In West Africa, Patience Koku, who farms with a pivot irrigation system, tells IPS, "the importance of irrigation in increasing grain yields cannot be over emphasised." "We are currently able to grow two crop cycles a year, meaning we double our output annually. In addition to this our grain yields are always higher in our irrigated crop. Corn cobs fill up completely to the tip, translating in higher yields," Koku said. "The profitability of irrigation is proven and in most cases there are high rates of return," said Badiane. "A commitment was made by African leaders in Maputo in 2003 for countries to allocate 10 percent of their national budgets for agriculture. If they did so, a fraction of that could fund the 47 million hectares of irrigation. The funding gap for irrigation is huge because the potential is large." Badiane said by making irrigation a high-level priority, African governments can attract private sector investment and innovation and facilitate the uptake of technologies in growing agriculture to drive economic growth. Improved regulations for safe and sustainable use of water are also a driving factor in promoting irrigation development. Irrigation allows farmers to produce crops over extended periods, particularly in areas where there is one rainy, Badiane said, noting that there was a business case for investing in irrigation as a way to pull farmers out of poverty while securing food and income. Badiane said irrigation development will help deliver on the food security and nutrition targets under the African Union's Agenda 2063 and the Malabo Declaration. A critical factor was getting the buy-in of decision makers at the highest level of government who need proof that irrigation works. Decision makers do not take innovation lightly because they know the cost of failure is extremely high, said Badiane, adding that scaling up irrigation development will aid agricultural transformation. "Africa, in particular, will require nothing short of a complete water transformation," says Nathanial Matthews, Programme Director at the Global Resilience Partnership a partnership of public and private organisations that work together to build a resilient, "sustainable and prosperous future for vulnerable people and places". He urged Africa to transform its water use by scaling up traditional practices, deploying new technologies and improving governance. "Taking action is urgent, with 95 pe cent of the continent relying on rain-fed agriculture and 25 countries already experiencing widespread hunger, poverty and under nutrition," Matthews told IPS.